The next generation of cities is here. We are living in a world where many urban areas are being transformed and using more efficient and sustainable approaches. In essence, various populated areas are turning into “smarter cities” where every aspect of the city is hyper-connected through technology and other means. The City of Coral Gables is one of many cities that are working toward this goal. In an effort to ramp up its efforts, the city has partnered with the University of Miami’s School of Architecture and the Center for Computational Science to host a competition that will give applicants the chance to bring their ideas to life by prototyping technology solutions that will help alleviate traffic-related challenges in the city. The Design Your Coral Gables Competition is focused on five specific sub-problems under the general domain of transportation and traffic. Applicants, from all industry backgrounds, may choose to focus their solution on one of five sub-problems the city is facing: commercial trucking, parking, environmental sustainability, public safety, and speed safety. 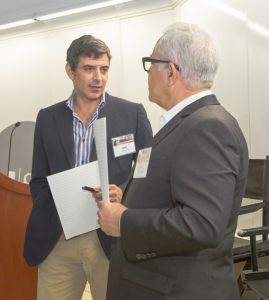 Neil Schwam (pictured on the left at Smart Cities MIAMI 2019), who has a background in finance, economics and technology, is part of the team “Smart Day Coral Gables.” The team, comprised of four people, have come up with an idea of a unique data service that can/could help the city understand how it can better allocate city resources and services on a daily basis. “If the City knew the precise trends of how people moved through the City over the course of a day, where people were throughout the day, and was able to continuously collect and analyze this data, then the City can determine where they need to make changes,” said Schwam. Schwam and his team are in the process of creating a data service that will run on smartphones ‘behind the scenes’—taking existing location and other data from popular apps such as Instagram, in order to map and understand these trends. 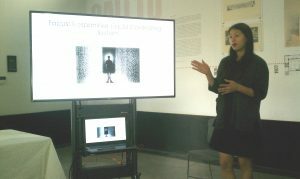 It’s worth noting that while harvesting such data, Schwam said identify and personal information will be kept private. They believe this will be one of several resources the city can use to help alleviate all five of the City’s defined problems. Another team named “Connect” is confident they have what it takes to help the City of Coral Gables. Zhengrong Hu, a current PhD student at the University of Miami, said the team wants to bring the technology from a smartphone into the infrastructure around us. They want to do this by using real-time data. “Everybody is always on their phone. People use them all the time while walking and driving. One of our ideas is to perhaps use augmented technology to beam a traffic light onto a pavement for pedestrians who are looking down at their phone,” Hu said. The team said it also wants to be able to project images that show messages on informational panels beneath traffic lights through LEDs. They also plan to be able to send alert lights to warn speeding drivers through high-powered LEDs. They hope their system will help provide policy recommendations to secure every intersection in the city, and eventually serve as a long-term decision support system for citizens and government. These two ideas, along with several others are slated to be presented at the annual eMerge Americas Conference on Monday, April 29. Competitors will present from 2:00 to 4:30 PM on the second floor of the Miami Beach Convention Center (Room 210). If you’re interested in attending, register here and use code TEGLUM.